Introduce young readers to the fascinating process of how catepillars become butterflies. Follow the transformation from a tiny white egg laid on a leaf to a brilliantly colored butterfly in this kid-friendly introduction to metamorphosis. With detailed, bright watercolors, Gail Gibbons illustrates the life cycle of the monarch butterfly, stage by stage, as it grows, changes, and takes flight. With clear, labeled diagrams and simple text that defines and reinforces important vocabulary, Monarch Butterfly introduces key concepts of insect anatomy and behavior. And of course, the unique migration of the monarch-- which can range up to four thousand miles-- is covered, with descriptions of how the insects travel, and how people in their path celebrate the occasion. This classic look at butterflies also includes directions on raising your own monarch at home, and a page of fun facts about these colorful butterflies. According to The Washington Post, Gail Gibbons "has taught more preschoolers and early readers about the world than any other children's writer-illustrator." 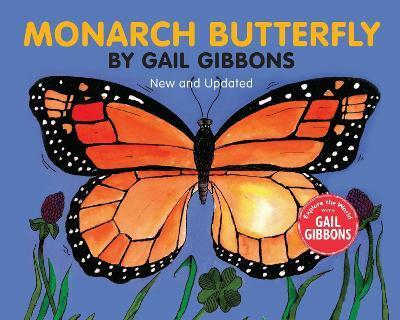 Ms. Gibbons has published more than 100 informational titles, including the bestselling titles From Seed to Plant and Monarch Butterfly, all fully vetted by experts. Her many honors include the Washington Post/Children's Book Guild Nonfiction Award and the NSTA Outstanding Science Trade Book Award.